Are you looking for more information about a particular cheese? How about a selection from a particular country? 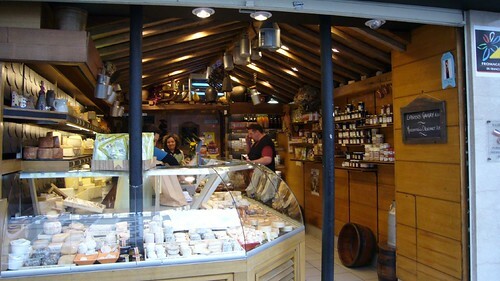 Cowgirl Creamery, the artisinal fromagerie near San Francisco features a nice library of cheese on their web site. Shaped like a pitted melon, this neon orange cow milk cheese from Flanders, Normandy has many stories told about its creation. My favorite tells a tale of France’s King Louis XIV, who banned the importation of Edamin (Edam ) from his country. Apparently, the king decided that the Dutch cheese was getting too popular among his subjects, whom he felt, should be eating local: French cheese for French people! He commissioned a French copy of the cheese and ordered it dyed orange. Now, either that was to ensure that no one mistook the Mimolette for Edam again, or, given that Louis XIV had issues with the Dutch Royal House of Orange-Nassau, maybe it was a bit more personal. Dyed with the annatto seed, Mimolette is aged for at least two years during which time it develops a chewy texture and a smoky, almost bacon-like flavor. 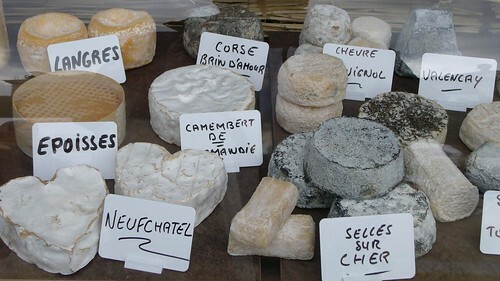 Gridskipper, a blog for travelers and locals, has a great post about the finest fromageries in Paris. I was surprised to find one of them, Eric Lefèbvre, is literally around the corner from my apartment. I’ve shopped there many times but did not know of the pedigree. 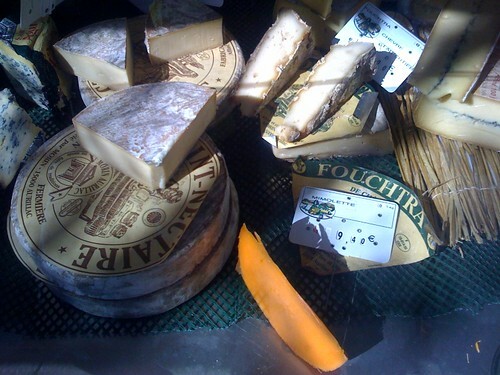 This article spotlights other fromageries that are located outside of the city’s center. I smell a road-trip in the future. I need to grab my bike and go shopping. Hours: 8:00 a.m. – 1:00 p.m. and 4:00 – 8:00 p.m.; closed Sunday afternoons & Mondays. I stopped by Taste cheese shop in San Diego yesterday to try some Southern California cheese. Unfortunately, there are not a lot of options for this region. However, they did have some Goudas by Winchester Cheese Company, located near Temecula. Gouda‘s come from all over the world. However, Winchester has developed a truly Southern California experience. Their Jalapeno Gouda is a smooth cheese with a kick. Our Boere Kaas (farm made) Jalapeno Gouda is a premium cheese aged a minimum of 60 days. The jalapeno and red peppers give it a moderately spicy taste. It is an excellent and flavorful accent for all occasions. This cheese won First Place at The American Cheese Society contest. Gold Medal Winner at L.A. County Fair. I was at the Bastille Farmers Market this morning. 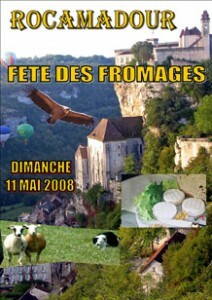 I purchased some yogurt, comte, and fromage frais de chevre from a popular stand. Afterward, I noticed the light coming into their stand and took this photograph. You can practically taste the mimolette. Mimolette is a magnificent cheese with apples. There’s nothing like a chunk of very old mimolette with a crisp, sweet apple. Most of the apples I’ve found in Paris are softer, baking apples. If you’d like a crisp apple ask for pomme à croquer. To celebrate our 3rd anniversary we’ll be hosting our Summer Solstice Food Festival on Saturday, June 21st from 11AM – 6PM. More than 2 dozen local Bay Area food artisans will be on site throughout the day sampling their unique and wonderful products. Janet Fletcher (James Beard award winning food writer for SF Chronicle) will be in store from 12 – 2PM signing her latest book, Cheese & Wine, a guide to selecting, pairing, and enjoying; and our knife sharpening service will be on-site to sharpen your knives and instruct you in the sharper side of life. Live Music, and much, much more!! Festivities begin at 11AM and continue to 6PM. Cheese Plus is located at 2001 Polk Avenue in San Francisco. Their phone number is (415) 921-2001. Blue D’Auvergne is a milder blue cheese than its nearby cousins in Roquefort. It is creamy, smooth, and cooks/melts easily. It may not have the punch needed for a hearty blue cheese souffle or sauce, but it is great to eat in salads and by itself. Bleu d’Auvergne is a name-protected (Appelation d’Origine Controlée, AOC) cheese from the Auvergne region in south-central France, where it has been made since the middle of the 19th century. Bleu d’Auvergne is made in the traditional manner from cow’s milk and features blue veining throughout. Its moist, sticky rind conceals a soft paste possessing a grassy, herbaceous, and (with age) spicy, pungent taste. 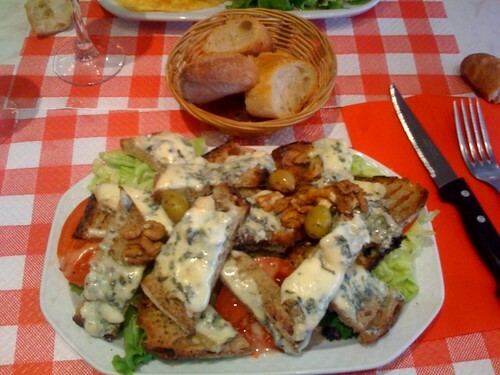 Recently, i had this salad with tartine at a small brasserie in Paris. The beauty of this dish lies in its simplicity. The salad consisted of greens, tomatoes, walnuts, and olives. A tartine was made with a slice of Poilâne bread, smothered with Blue D’Auvergne and placed under the broiler for a minute or so to melt the cheese. This was then cut into smaller pieces and placed on the salad. The bite sized chunks of cheese and bread made the salad a great meal. Try this for dinner tonight. This reminds me of soap-box derby races on crack. The guy in fluorescent yellow steals the show. But what about the poor cheese?